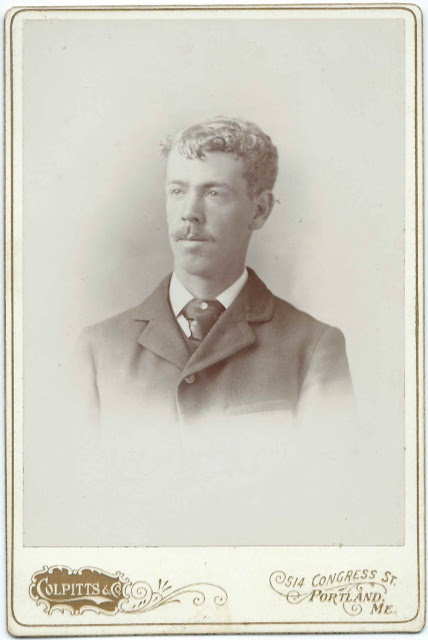 Cabinet photograph of a man identified on the reverse as George Ivory Morse. 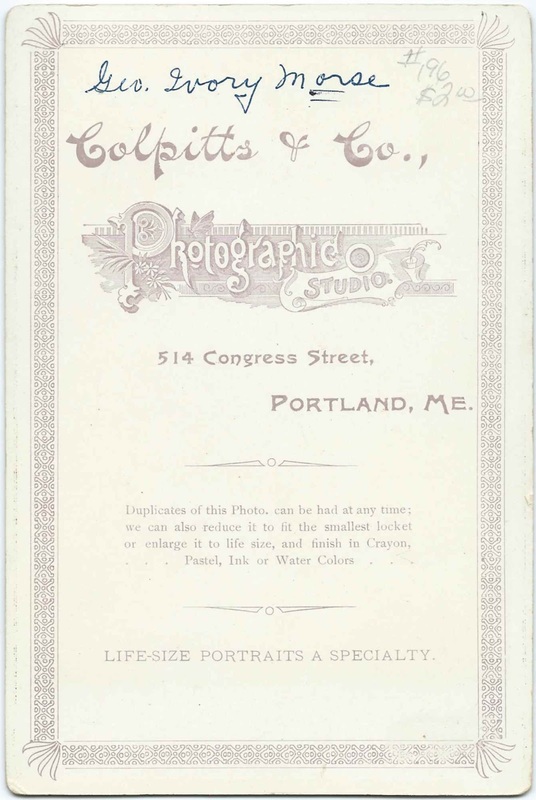 The photograph was taken by the Colpitts studio of 514 Congress Street, Portland, Maine. George Ivory Morse, who appears to have gone by his middle name of Ivory, was born 6 September 1873 in Maine, the son of George Shaw Morse and Martha Ann (Rogers) Morse. On 4 December 1918, George Ivory Morse married Mabel May Mayberry, daughter of John Colby Mayberry and, I think, Mary Abbie E. (Witham) Mayberry. Mabel was born 18 May 1875 at Windham, Maine. Sadly, Mabel died 21 August 1919 at Windham, Maine, of ovarian cancer. On 18 May 1936, George Ivory Morse married widow Martha Ann (either Gray or Whitney or ?). Martha died after the enumeration of the 1940 Census and before 7 July 1948 when Ivory married his third wife, Isabel Cobb of Dry Mills. The Maine Marriages database has two listings for Isabel, as Cobb and as Anderson. which of them, or neither, was her maiden name, I don't know. George Ivory Morse's obituary in the July 18, 1953 issue of the Lewiston Daily Sun mentions that his wife, the former Isabel Cobb, survived him, as did his brother Dwight Peter Morse. The obituary also notes that George Ivory Morse was a farmer for about 60 years at Standish Neck before moving to Dry Mills. If you have corrections and/or clarifications and additions to the information above, please leave a comment or contact me directly. Thanks!